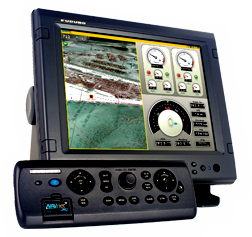 Furuno’s NavNet 3D is a groundbreaking navigation system that breathes new life into the user interface. Once you start using NavNet 3D, you will be amazed at how a system so powerful can be so simple to use. NavNet 3D comes fully loaded with groundbreaking new features that will expand your navigational horizons. NavNet 3D uses a cutting-edge technology we’ve named “Time Zero.” Time Zero facilitates instant chart redraw, allowing for zooming in and out, changing chart display modes and other chart handling functions seamlessly and with no lag at all. Time Zero brings you a truly seamless navigation environment you have to experience to believe. NavNet 3D is the only Chart Plotter on the market that allows you choose the type of charts you want to use. Your system comes preloaded with all currently available NOAA Vector (computer generated) and Raster (scanned paper charts) that are converted into the NavNet 3D MM3D format. You also have the option to purchase C-MAP by Jeppesen Vector charts that have been converted to the MM3D format. These C-MAP by Jeppesen charts are comprised of the same cartographic chart information found in Jeppesen’s C-MAP MAX and C-MAP MAX PRO charts. For certain parts of the world, you can purchase Datacore by Navionics Vector charts that are based on Navionics Gold cartographic chart information. Finally, there are free Fishing Charts for the US that are preloaded on each NavNet 3D system that give you detailed NOAA bathymetric data for a variety of fishing hot spots. NavNet 3D incorporates a whole new dimension into chart presentation with Full Time 3D chart rendering. You can choose a 2D top-down view of the navigation chart for a look and feel that duplicates a traditional chart plotting presentation. Or, you can choose to pan and zoom the chart to any angle at any range scale you choose instantly. There is no ‘3D mode’ to change into and no waiting at all, because NavNet 3D operates in this 3D environment full time. There are no special ‘modes; that limit your ability to navigate the way you want. With NavNet 3D’s true 3D environment, you can see all of the information you want with no limitations on what information you wish to view. Plan your routes and enter waypoints directly on your raster or vector native 3D charts. Radar overlay, Sirius Network Weather Receiver, AIS, plus all of your chart symbols and depth soundings; any and all of this information can be displayed at will. This is the beauty of navigating in true 3D. You have full control over the presentation all of the time. NavNet 3D integrates Ultra High Definition (UHD) Digital Radar that facilitates fully automatic, high-precision Gain, Sea/Rain Clutter and Tuning control for hands-free operation and ultimate performance. UHD offers crystal clear, noise-free target presentation with automatic real-time digital signal processing. Antenna rotation speed (24/36/48 rpm) is automatically shifted appropriate to the pulse length. Commercial-grade radar performance is now available in the ultimate MFD navigation suite. One of the amazing features of Furuno UHD Digital Radar is ‘Real Time’ dual range radar display, which scans and displays two different radar ranges with no lag at all. This greatly enhances your situational awareness. NavNet 3D challenges the conventional menu operating system with a whole new concept, the ROTOKEY on-screen revolving menu key. One turn of the Rotokey gives you instant access to full control of NavNet 3D. NavNet 3D provides the easiest user interface on the market with a combination of both Rotokey and familiar point-and-click cursor pad controls. The power of the point-and-click interface allows for incredibly simple operation – click anywhere on the screen for context-sensitive options for that area. Click on any data box to access detailed information for that function. You can also connect a generic USB mouse to further simplify operation.